Spend one or several days Rock Climbing sport, trad or multipitch routes around madrid with our qualified climbing instructors. 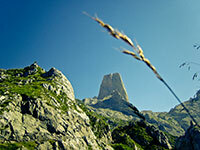 Enjoy the granite slabs of "La Pedriza" or the limestone crags of "Patones" just one hour away from the downtown. Tell us "Where" and "When" and we arrange the climbing trip. Dare to vertical! All our guides are qualified instructors in mountain sports , rock climbing and canyoning. Activities and courses are conducted with liability insurance and accident insurance included. The technical equipment meets the standards of mandatory certification. Patagonica provides individual and collective material for activities and courses. 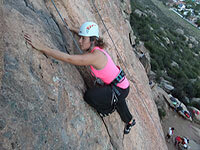 For those begginers who want to try outdoor rock climbing and abseiling around Madrid for the first time or more experienced climbers that want to try the friction climbing in "La Pedriza" or sport routes in "Patone´s" limestone crags. Several options to enjoy a different day just 1 hour away from Madrid! Climbing Spots: La Pedriza - Patones. All week - Monday to Friday 10% discount. Gloves and beanie (winter ) , Cap and sunglasses (summer). Backpack (To carry water, food and some extra clothes). Extra Clothes to leave in the car. Personal equipment: Helmet, harness, climbing shoes. 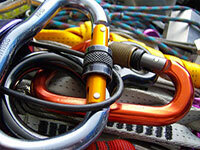 Climbing gear: Ropes, cords, carabiners, belay devices and descenders, first aid kit. Not included: meals, drinks and transport (extra fare - contact us). The group can be created by individual participants. Small groups (max 6 people). Bigger groups, contact us for details. For those who want to try multipitch or trad routes for the first time or more experienced climbers looking for a different day around Madrid. La pedriza and La Cabrera are perfect granite spots and offer us hundreds of routes to enjoy the mountain range close to the capitol city! Ideal to practise the knowledge acquired after a climbing course. Climbing Spots: La Pedriza - La Cabrera. Small groups (max 2 people). Climb that route or wall you've always dreamed of, guided by our qualified climbing instructors. Pico de la Miel, El Pajaro, Yelmo, Torreon de los Galayos, Naranjo de Bulnes, Peñon de Ifach...These are just some of the many areas where we can climb unforgettable itineraries. Ask us and we'll make your dream come true. La Pedriza, Madrid, Alicante, Pyrenees, Picos de Europa, Galayos. Monday to Friday 10% discount. Gloves, hat (winter ) , sunglasses. Accident Insurance and liability insurance. Not included: meals, beverages and transport. Min 1 - Max 2. Phone for details or contact us.